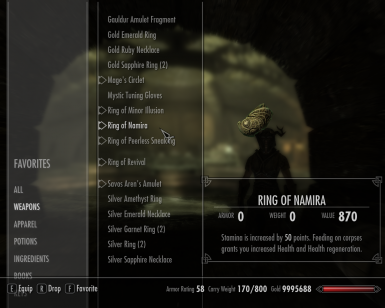 A full set of rings from in game that you can equip. wrye bash bashed patch 0, timmypod. Just like the description says an unlimited amount of rings can be equipped at once. I've done all the hard work. This is meant to be used as a modder's resource. Feel free to use it however you want. Please report any bugs you find and I will try and fix them sometime. I will upload infinite amulets next weekend if someone doesn't beat me to it. Un equip any rings before activating this mod. Un equip, save, activate. Back up a save just in case. If you want to use crafted rings you must equip the ring you want to craft first and keep it equipped in order to use multiple crafted rings. All 102 vanilla loot rings are available . I'm sure someone will try equipping all 102.... . Before anyone else asks me to make a limited version with just 2x or 4x or 8x - I'm looking into it.